The images below show the eighteen new activities of the catalogue Genuine Corporate Experience from Costa Brava Girona Convention Bureau. All the experiences of the catalogue aim to help you complete the social programme for your proposal for a meeting, conference or business event with activities linked to the surrounding landscape, culture, culinary tradition and history of the Costa Brava and Girona Pyrenees. Aventura Girona will take you on a walk along one of the most breathtaking parts of the network of coastal paths. The itinerary will help you discover the treasures of the Costa Brava’s scenery and heritage and you will have a photographic report as a souvenir of the experience. Fil Mediterranean Travel Designers proposes an electric bike ride through the landscape and villages of the Empordà region which inspired Dalí’s mystical paradise, ending up at the Gala Dalí Castle at Púbol to discover the most personal vision of this locally-born genius. Restaurant Sala Gran offers an experience combining culture and gourmet food, based on the human and literary figure of the great Empordà writer, Josep Pla. We go inland to discover the innovative, creative genius that characterises the Universe of Shared Creativity initiative set up by the RCR Pigem Aranda i Vilalta architects’ studio, winners of the 2017 Pritzker Prize, also known as “architecture’s Nobel”. Fil Mediterranean Travel organises the experience, which includes lunch at a restaurant with 2 Michelin stars. A thousand metres up in the air, soaking up the silence and the magical sensation of a hot-air balloon flight with Globus Empordà, the Costa Brava’s landscape stretches out beneath us as if we were birds flying over it. Coaching Altitude will test the team’s cooperation, trust, coordination and leadership skills with outdoor activities in the heart of the Garrotxa Volcanic Area Natural Park. 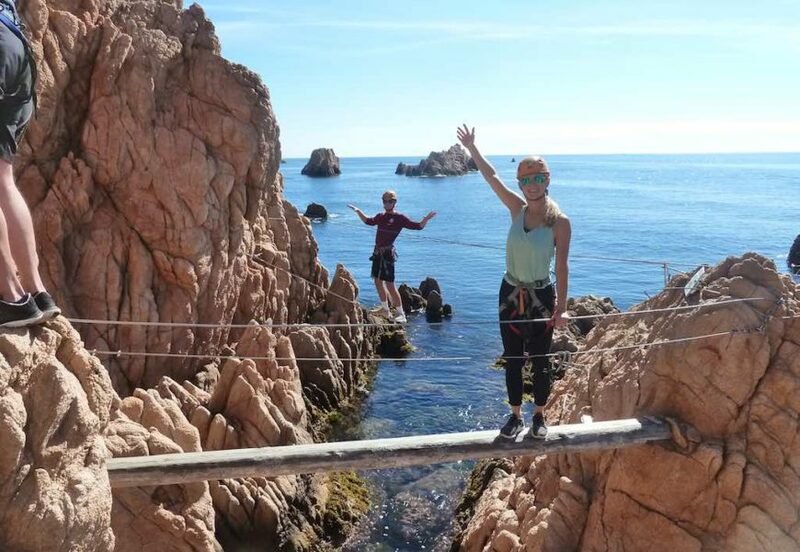 The guides from Aventura Girona will take you to enjoy a unique perspective of the cliffs that characterise the Costa Brava’s scenery, as you climb the via ferrata in Cala Molí, the only one in Europe to be located so close to the sea. Paddling a kayak down the River Ter along sections of Mediterranean ecological corridors included in the Natura 2000 Network programme is the way Kayak del Ter proposes to explore one of the best-conserved riverside woodlands in Catalonia. Humanside Experience leads this treasure hunt, with teams competing on land and sea with the aid of iPads to guide them along coastal paths and tracks, and on the sea on a big SUP (giant paddle board) as they overcome tests that make for a different, highly attractive way of exploring our coastline. A unique sensory experience at the Albanyà Astronomical Observatory, under the expert guidance of prestigious astrophotographer Juan Carlos Casado and his team of resident astronomers. The Observatory is set in the first international dark sky park in Spain to be awarded this distinction by the International Dark Sky Association. Mindful Nature proposes a combination of mindfulness techniques with harmonious sounds from nature as a wellness activity to enhance concentration and intuition under the guidance of Mindfulkit. Sports-loving teams will find this Sports Course Week the ideal environment for an incentive activity lasting 1-5 days. Everything is carefully planned and organised: accommodation at local hotels, tournaments run by professional coaches, daily training and matches and a programme of complementary leisure activities. Restaurant Sala Gran has prepared everything for you to discover Mas Oller’s winery and vineyards and to take part in a wine-tasting session before sampling chef Isaac Sabrià’s fine cuisine, based on locally-sourced ingredients paired with Mas Oller wines. Culture, heritage and good food are explored through the ancient cork-making profession of the tapers. A guided tour led by Restaurant Sala Gran revives a selection of dishes that locals used to eat and visits the most important cork-making heritage ensemble in Europe. Humanside Experiences gives more innovative gourmets the chance to experiment with the latest techniques in gastronomic science to create spherifications from the most typical dishes in local cuisine. Humanside Experiences provides all the ingredients and equipment necessary to test the teams’ skill and creativity as they compete to cook the best Catalan rice casserole. An anchovy-salting workshop, a visit to the fishing port and lunch at the fish market make up this activity proposed by Fil Mediterranean Travel Designers to enable participants to experience a fishermen’s tradition dating back to ancient times and still very much alive today.